Following the success of the BIG EVENT 2017, the City of Carrollton is bringing the festival back in 2018. 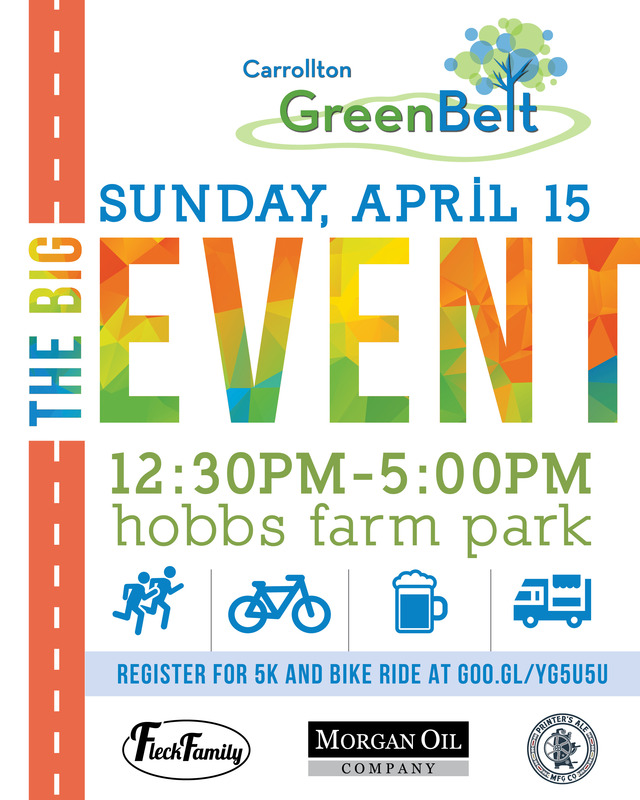 The BIG EVENT 2018 will take place on Sunday, April 15, from 12:30 pm to 5 pm, and will feature all the good stuff we had to offer last year: the food trucks, craft beer, family fun, live music, disc golf, and, introducing craft activities for the kids. The 5K and Bike Ride fundraiser will benefit a Public Arts Master Plan. To register online, visit EventBrite here. The online registration closes Wednesday, April 11, at midnight. To register in person, visit the Carrollton City Hall. Cash and card accepted. The in person registration closes Wednesday, April 11, at 5pm. Early t-shirt and running numbers pickupis scheduled for Thursday, April 12, at the Depot on Bradley, between 11am and 1pm. This is also the last chance to register before the day of the BIG EVENT. Day-of registrations will be allowed at 12:15pm on Sunday, April 15.